I had never heard the word myofascial. I had been going thru something new these last two months. Laying in bed I struggled to find a comfortable place for my legs. Every 30 to 40 seconds I’d feel so much discomfort I had to move and try another position. I was so dismayed. When I looked at the clock it said I’ve been doing this for 40 minutes! I felt I would never get to sleep. Something had to change. At this point I had only read about chronic myofascial pain. -ee-uhl] pain with fibromyalgia but only in the context of it being a double whammy in the pain department. I knew my fascia were hurting, but now this was unbearable. My doctor had tried a compounded cream when she had planter fascitis. She said, ‘this works!’ So she ordered some for me. I was anxious for it to come in the mail. I followed the directions and rubbed in it for two minutes at each place. Continuing with the rest of my day, I felt wonderful relief when I rubbed it in all over both legs! It was a lot of work but it was worth it. I’m so sorry that I don’t remember the name of it. Myofascia is the thin and almost translucent film that wraps around muscles. You can see this sticky white film covering some of the chicken parts you buy at the grocery. It supports and gives shape to your musculature. 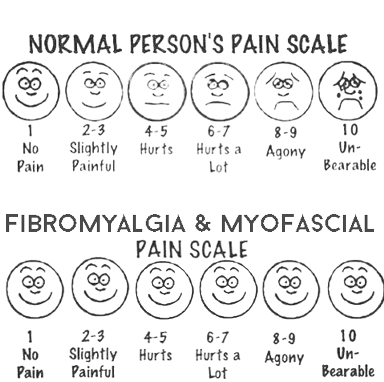 This pain over this web like system can be diagnosed as Chronic Myofascial Pain. Fibromyalgia and chronic myofascial pain (CMP) share muscle pain as a symptom. 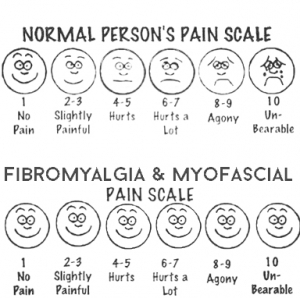 There is no cure for fibromyalgia, but we know there is a lot we can do to ease that pain. But CMP is a condition that is potentially curable, with thoughtful treatment of the specific trigger points, and corrective action to prevent their recurrence. This can only happen if there are no perpetuating factors, a fixed uncorrectable underlying cause. Fascia can became attached to muscles, but massage is the best treatment. Fibromyalgia and CMP have similar symptoms. Patients with widespread muscle pain have been diagnosed with fibromyalgia, but in fact their pain is from CMP or some other source. Even fibromyalgia literature is repleat with references to myofascial pain and symptoms. If your doctor tells you he’s never seen a patient with just FM or just CMP, so they must be the same condition. Right? Nope. It takes a great deal of training and experiences to palpate trigger points. We need more doctors trained in this area! It is important for your medical team members to understand that complex overlapping pain patterns exist in chronic pain patients. One patient could have FMS and CMP as well as joint problems and other factors causing pain. Each of these should be treated separately. Treatment must proceed carefully. Dr. Gerwin was one of the first doctors who studied these conditions separately. He grasped and recognized the study of Dr. Travell and Simon’s advanced work on trigger point therapy. The fascia causes pain by tightening around muscle. Fascia also can began to harden. This is only one reason that movement is so important. Be careful not to over exercise, but stretching and walking is favored amoung doctors. I savor the taste and breathe of life. I embrace life and all its colors, sounds, and textures. I gather my dreams and give them wings. I am filled with joy and wonder. Comments have been closed because of spam.